This bloodtrail is 100% real. 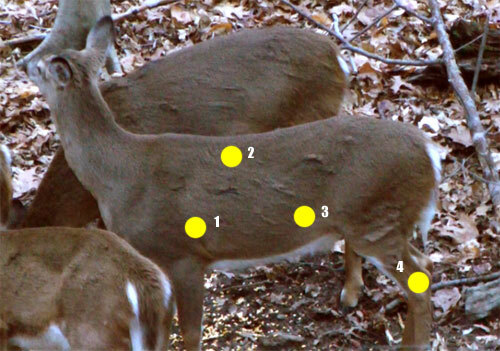 All the pictures and steps are as it happened during a Connecticut deer hunt in December, 2011. Good Luck! 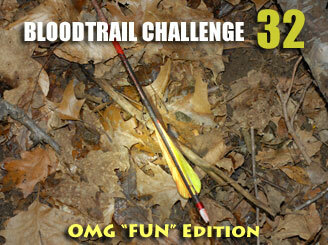 At the request of our visitors Bloodtrail Challenge 32 is designated as an "OMG" Edition. That means it is filled with twists, mind games, and questions which will make you scream at your monitor. It is not meant for education (or anything useful) but it will test your ability to out-think Bowsite.com. This challenge is meant to have FUN, so please try and chill-out. A group of deer appear during an urban antlerless hunt in Connecticut. This mature doe gives you a decent shot which will clear the deer behind it. We have given you four options. You need to put these shots in order from hardest to recover to easiest to recover.